This vehicle is aptly named the Mondo Spider. It’s not from some apocalyptic movie, but seen here at Burning Man. Like a lot of Burning Man exhibitions, it was built for the joy of the build and with a rather extreme budget: $15,000. We’ve embedded one of the many videos after the break, as well as a few of the hardware details. Weighing in at about 1600 pounds this eight-legged horror is much more massive than the rideable hexapod we saw a while ago. A Honda 24 horse power V-Twin engine provides the power needed to run the hydraulic legs. It’s designed to turn on a dime, but as you can see in the video, traction can be a bit of a problem. For night-time operation the legs have been outlined in glowing read, as if this wasn’t already frightening enough to terrify the weak-at-heart. Editorial Note: There was so much work and time put into this project by a lot of different people. We searched around for a picture of the entire team with this bad boy but couldn’t find one. If you’re working on an insane team build, don’t forget to take a group picture that will let you relive the fun times. That’s what the Copenhagen Suborbitals did. I really wish i could go to burningman. I know it’s heavy but with a 15 grand budget they couldn’t make it just a _little_ smoother? seems like some dampeners on each leg would go a long ways and a redesign of the actuall activators would solve everything. Yeah it looked like it was mostly smooth but occasionally you see his head really jerk! 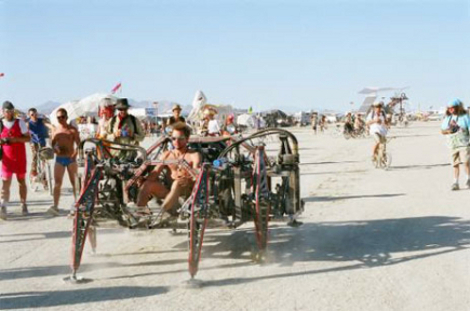 Maybe it’s a “feature” to keep the driver awake/conscious — it *is* burning man after all! Heh, of course it was at burning man…so much preparation, craziness, nekkidness, drugs, alcohol and sleep deprivation. Good times. Saw it on the playa last year…it’s a pretty surprising thing to have a dust storm die down and all of a sudden that thing is coming at you. wouldn’t it be an octopod? I would like to attend Burning Man but if I see one guy in a blue speedo I’m leaving. Mr. Twister, you’ll have no problem then. No one wears clothes at Burning Man. Dust and mud are the coverings of choice. Re: I know it’s heavy but with a 15 grand budget they couldn’t make it just a _little_ smoother? seems like some dampeners on each leg would go a long ways and a redesign of the actuall activators would solve everything. We installed motorcycle shocks on every leg when it was built. It hops up and down because the leg linkage can’t be made smooth with 2 legs per corner. The legs move in a D shape, but there’s a little dip between the time one leg lifts until the next leg drops. The smooth walkers using the 7 link leg have to use 3 legs per corner. At this scale 15k doesn’t go too far, I’m surprised thats all it cost. I got to go to burning man sometime. where’s the arduino, I couldn’t see where it was in the video? Is it under the chassis? Kind of ambitious on a $15k budget. whats the law concerning “driving” this on the road? Yikes…no way to delete misspelled posts. Sorry. You mean all the smiling and enjoying of themselves while they show off their creations and even race ’em with friends both new and old? Images of “The Wild Wild West” are coming to mind. Just add some flame throwers. Having built a six legged two joints version, I can say I’m impressed. We had a zero budget of material from the local scrapyard though, but it cost us an insane amount of beer to finish that project. “Zero Emissions?” Give me a break! I can see it now… the spider with a throne bolted to the top and Al Gore at the controls. Old hack is old. Unfortunately. Howdy,I love reading through your blog, I preferred to leave a little comment to support you and regard you a great continuation. Wishing you the better of fortune for all your blogging campaigns.